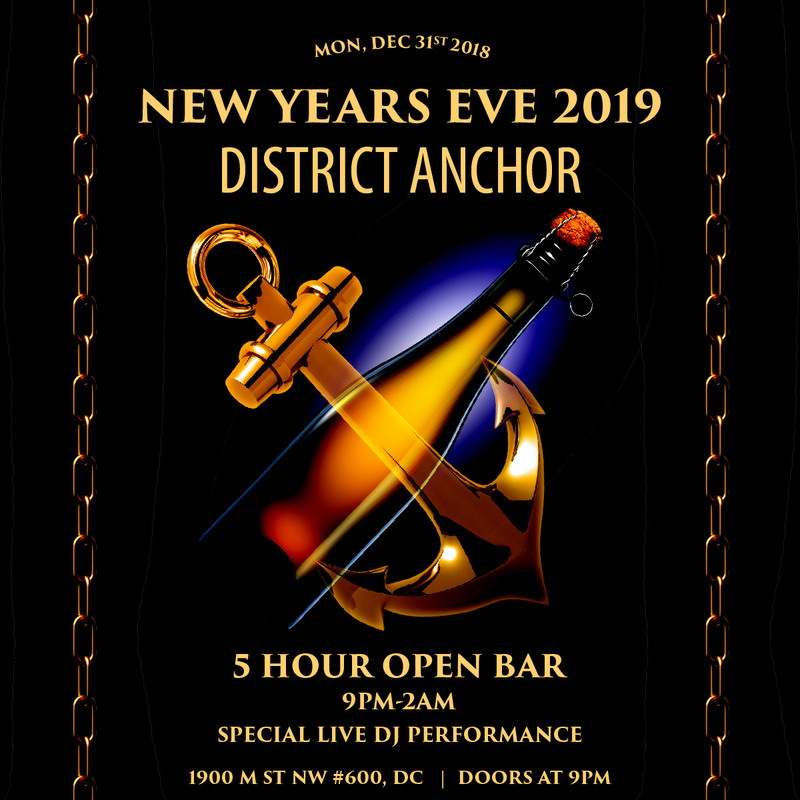 If you're ready to experience the best that Downtown Washington DC has to offer, come to District Anchor for an exhilarating New Year's Eve party. Beloved by locals and a fun attraction for out-of-towners, this intimate space is about to turn it up a notch this New Year's Eve with an all-out bash. This fully stocked event has more people than ever readying themselves for the District’s next party. District Anchor has always been packed with the most enthusiastic party-goers, and we promise not to disappoint this New Year’s Eve. Come prepared to dance, because we’re bringing in a live DJ to crush the night with hits from Top 40, house, and hip hop music. If all that booty-shaking builds up a thirst, grab the upgraded ticket option for five hours of a premium fully-stocked open bar that will keep your glass filled to the brim well into the morning. Feel the vivacity of the crowd as the DJ counts us down to the moment we’ve all been waiting for. Raise your glass of complimentary champagne when the clock strikes twelve, but don't stop there -- this party keeps rocking well after midnight. If you really want to make the most of your night, snag a VIP package and enjoy luxuries like delicious appetizers, reserved seating and bottle service. With an understated log cabin interior that transforms into a bumpin' dance club at night, locals flock to District Anchor on a nightly basis for a guaranteed a good time. Conveniently located in the heart of a thriving DC nightlife scene, this intimate space features a fully stacked bar, an area with floor-to-ceiling windows, and a cozy back room with a vintage moose head mounted over a roaring fireplace. The kitschy décor makes you feel like you’re celebrating the holiday at your neighbor’s – if your neighbor threw raging parties, that is. Come get swept away in the holiday fun. Tickets are on sale now for NYE treat at District Anchor that you won’t want to miss.